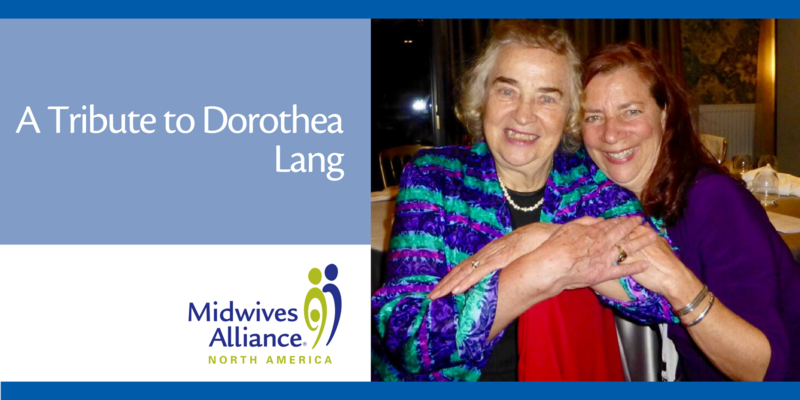 I am deeply saddened, as is the MANA community of midwives, by the loss of Dorothea Lang, CNM, MPH, FACNM, past President of the ACNM. She was a courageous and inspiring midwife pioneer, an outspoken advocate for ‘a midwife for every mother,’ an inspiring nurse-midwife educator and mentor to hundreds of students and young midwives, and a visionary leader in the quest for alternate paths for professional midwifery education. It was always a pleasure to talk to Dorothea because she was full of ideas for the midwifery profession. In her very civil and well-mannered way, Dorothea was not afraid to let her (strong) opinions be known. She was intelligent, innovative, thought provoking, and persuasive. She had the acumen to imagine a future for professional midwifery in the US and was not afraid of the decades of hard work it took to manifest her vision. In 2014, at the International Confederation of Midwives (ICM) meetings in the Czech Republic, I had an opportunity to spend an afternoon with her. On this occasion the conversation was markedly different. Dorothea did not speak about her ideas, she spoke about herself, which was unusual. Three of us — Diane Holzer, an Irish midwife, and I — sat spellbound as Dorothea told story after story of her life. Dorothea was born in Japan in the early 1930s. Her parents were missionaries. The experience of living in Japan shaped her life’s work. First, her parents taught her by example to live a life of service to humanity. Second, she learned early in life that birth was a normal process. Her mother had six children and Dorothea was the oldest girl. As a child it was Dorothea’s job to run and find the midwife when it was time for her mother to deliver her sibling at home. And third, Dorothea observed that the midwives of her village received great honor everywhere they went. People bowed to them, told them secrets they never told anyone one else, trusted them to care for their infants and their families. As a result Dorothea decided quite young while she was living in Japan that she wanted to serve humanity by being a midwife. Dorothea excelled in her chosen profession. She became powerfully influential in her home state of New York, on the national midwifery scene, and even internationally. The ACNM has posted a beautiful tribute to Dorothea with the details of her professional accomplishments. I believe it’s true to say this. For Dorothea, making trained midwives accessible to all women and ensuring that midwifery was well integrated into the US maternity care system was her life, her passion, her raison d’être. For over six decades and across several continents Dorothea had a fire in her belly for midwives, for women, and for families that could not be extinguished. Her main regret in her last weeks of life was that she would be missing the ACNM meeting, which she had attended every year since 1958. That’s almost 60 years! After a long, fruitful, and fulfilling life, Dorothea went into hospice in April 2017. She spent the last days of her life at her beloved cottage on the Hudson River. Friends reported that she was most happy and most at peace at her cottage, just watching the ships on the river and listening to the trains go by. Dorothea passed away peacefully at her home on the afternoon of May 16, 2017. She will be deeply missed by so many who loved and respected her, and by those whose life she touched in large and small ways. It was Dorothea’s request that any donations in her name be made to the A.C.N.M. Foundation.